Overview: Your credit card should pay you. Each time you swipe, you have a valuable opportunity to earn cash back on your everyday purchases you already make. 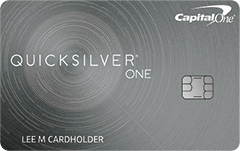 The Capital One® QuicksilverOne® Cash Rewards Credit Card offers exactly that. This card makes earning cash back easy. With the Capital One® QuicksilverOne® Cash Rewards Credit Card, you don’t have to worry about rotating categories or which card to use at each store. No matter where you shop, you’ll earn an unlimited 1.5% cash back. Your cash back rewards do not expire, and you can redeem at any time. Then use your cash back for whatever you choose. Your rewards are not limited to travel rewards and gift cards. This is simple cash back rewards that works. The card charges 24.99% Variable rate APR. The Capital One® QuicksilverOne® Cash Rewards Credit Card is designed for people with average credit. If you have defaulted in the past five years or have a limited credit history, this card is for you. After five months of on-time payments, Capital One will increase your credit limit. Cardholders and non-cardholders alike have access to CreditWise® from Capital One®, a credit monitoring tool built to help you improve your credit. This card comes loaded with standard benefits including extended warranty, price protection, auto rental insurance, travel accident insurance, travel assistance, and roadside assistance. The card charges a $39 annual fee. While an annual fee may turn you away from some cards, consider the benefits compared to the fee before you dismiss the card. If you spend $250-$275 per month on the card on average, which most people easily do between groceries and gas, you will earn enough to cover the fee. Any additional spending is cash back in your pocket!